Great styling can live with great value... 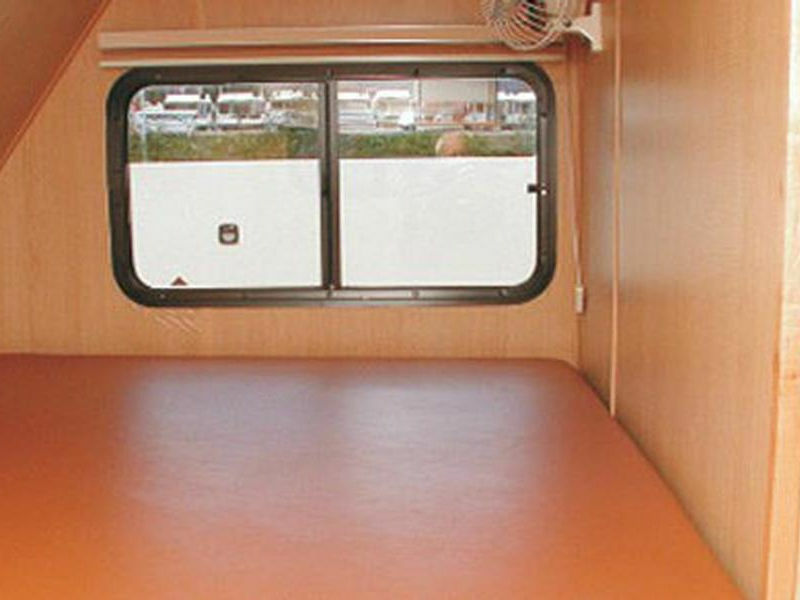 The Mirage 56 looks large on the outside and even bigger on the inside! 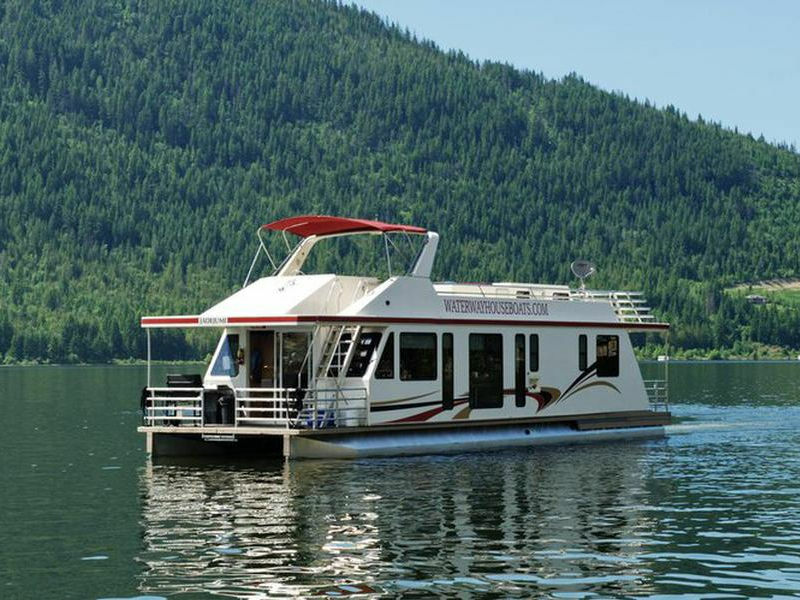 Finished in maple, this 56 foot houseboat has all the room, luxury, style and amenities that has made them a growing favorite. 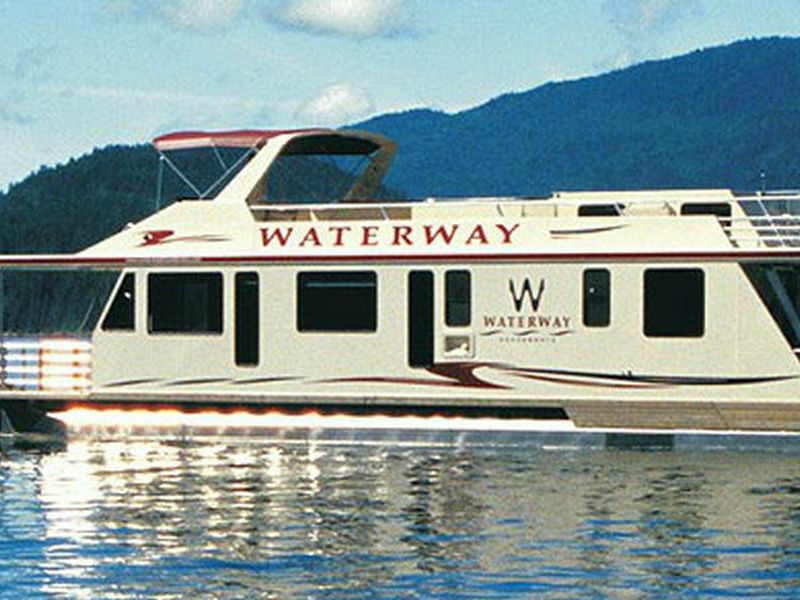 A fireplace, TV and DVD, satellite dish, water slide, CD stereo, fish finder, 1-1/2 or 2 bathrooms, 6 private sleeping areas, plus a hide-a-bed in living room, stairway to penthouse, microwave, 8 person hot tub on upper deck, and the bimini top. 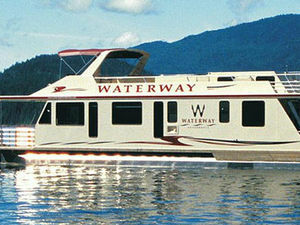 Take her anywhere on the Shuswap Lakes. Time to turn in.... The 3 staterooms on the Mirage 56 offer you Queen size beds, over head lighting, fan and storage. 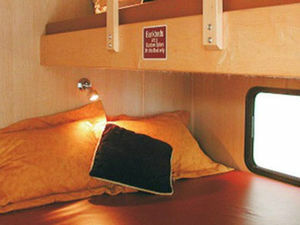 A large window to let the stars in at night. 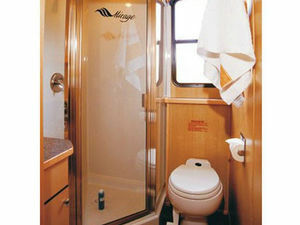 A private bathroom comes completely equipped with sink, vanity, mirror, toilet and glass enclosed shower. A half bath or 2nd full bath. 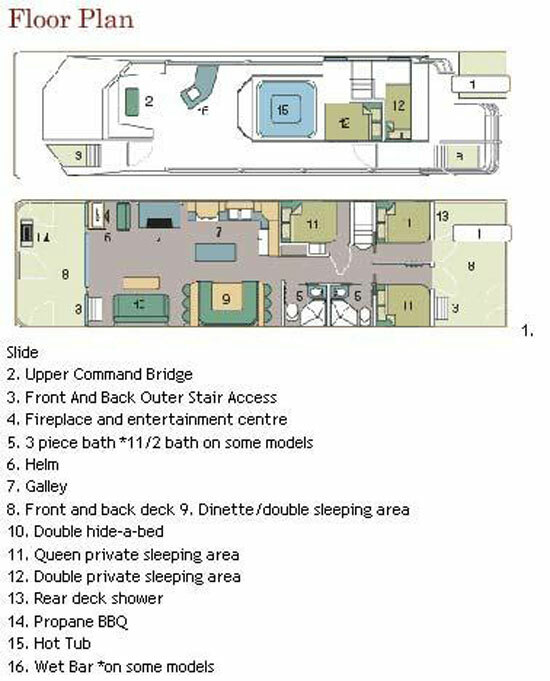 You've also got a penthouse with 2 double sized beds, a private sleeping area accessed by a stairwell or you can call it a porthole cuddy with a couple double size beds. 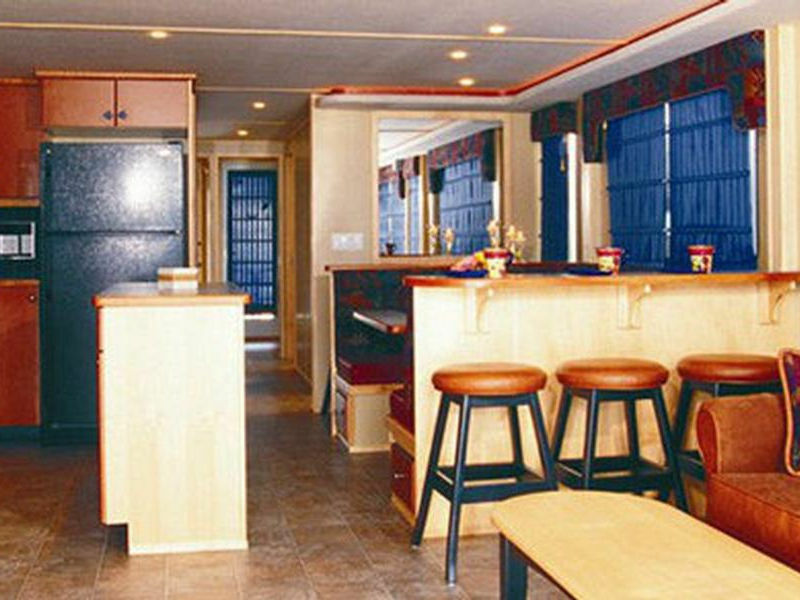 The Mirage 56 has been built with room in mind - with all the amenities you need for having a good time. 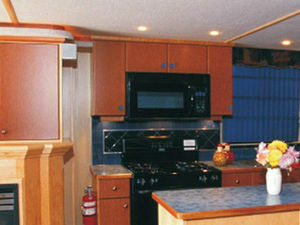 To satisfy your appetite the functional galley comes fully equipped with stove, 2 refrigerators , deep stainless- steel sink, substantial storage space, and microwave. Large windows bring the beauty of the outdoors in as you enjoy your meals seated at the comfortable dinette which makes down into a comfy bed for two. A lounge that makes you feel welcome... Summer sand tones and colors, expensive looking, but practical. 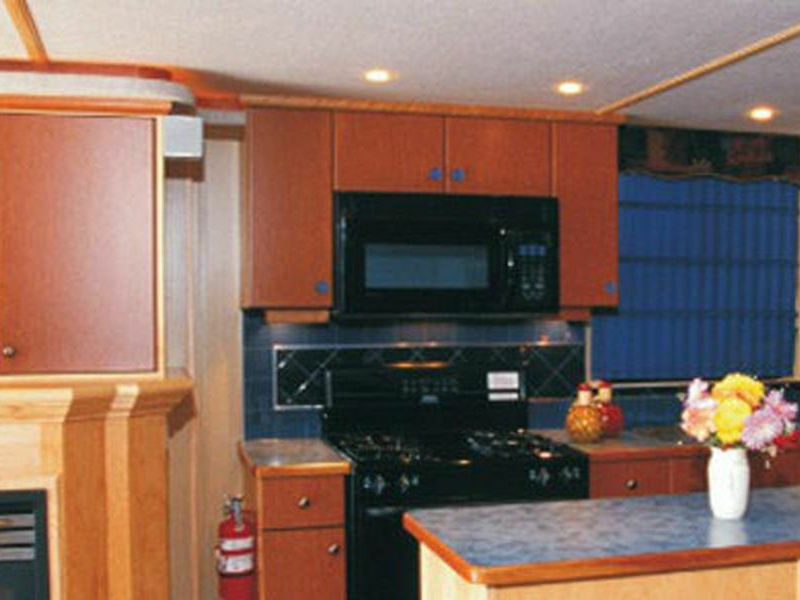 Direct/indirect lighting, an AM/FM stereo with CD player, fireplace, a TV with DVD player, and don't forget the fish finder located on the helm. A comfortable sofa that makes down into a comfy bed for two. Large windows and sliding glass doors which leads you out to the front deck to the outdoor propane BBQ grill and the cold storage locker. 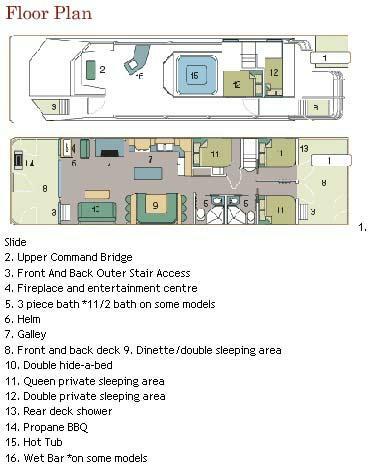 With this Mirage 56, just think of the fun you can have... when you step out onto the back deck you'll find an outdoor shower, swim ladder, and a stairwell leading you to the upper-deck where a hot tub, stereo, water slide and fly bridge await you and your friends. Enjoy the spectacular view from the top deck or lounge in the sun on top of the penthouse. Relax in comfort under the bimini top. 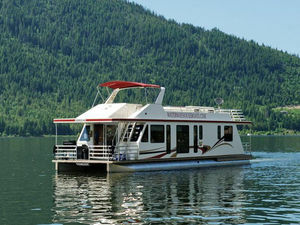 Your favorite tunes will sound even better as you cruise along the shores of the beautiful Shuswap Lake. The whole effect? It's an eye catcher, a head-turner, and a great beauty. The rental rates listed do not include sales tax, environmental fees, fuel expenses, propane or other options. A down payment of $750 is due when you make a reservation. A refundable security deposit of $2500 is due upon arrival if you purchase the insurance option. The refundable security deposit is $5000 without the purchase of the insurance option. Patio Furniture, Linens and Towels may be added for an additional cost.